Renee, that is quite possible. 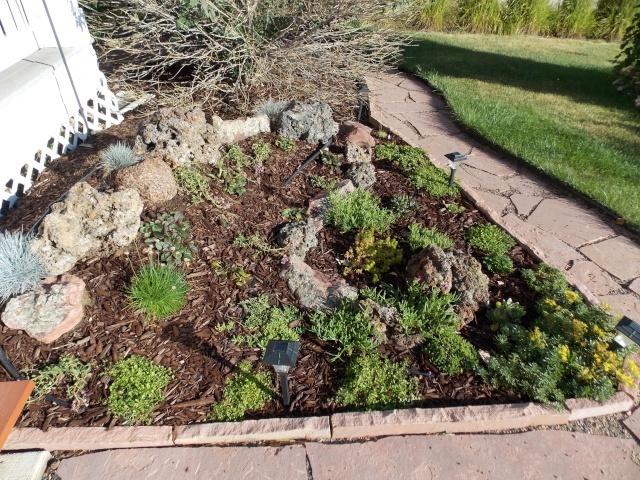 there was a article in the paper that talked of a couple that bought a old home and removed sod, layers of rock and found old garden beds from like 70yrs ago and the plants came back! 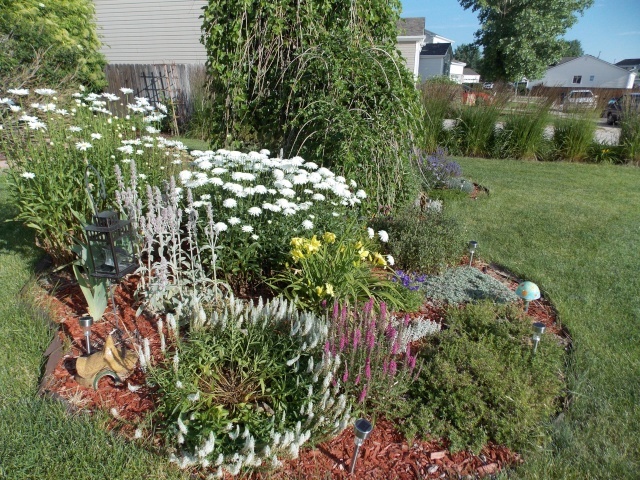 I try to buy a lot of xeriscape plants or "wild" CO native plants that will spread, i buy some things at home depot but some of my newer plants have come from a HUGE $$$ garden center and if i hit the sales right its not to bad. 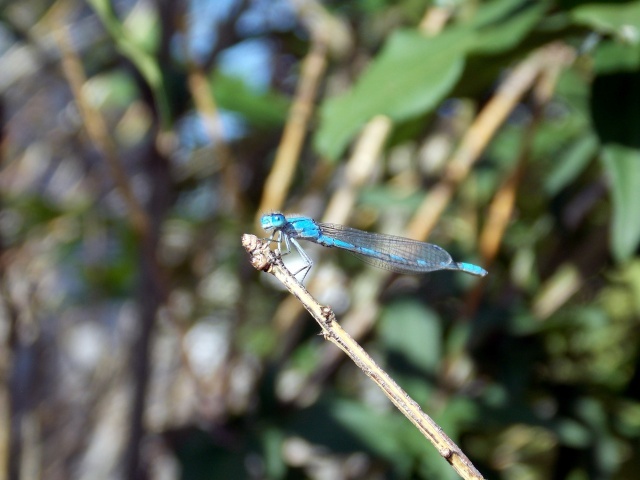 Your pond area is just awesome, I really love it!!! really looks amazing Jenn. I just can't picture Sierra doing that!!! She looks so sweet and innocent!!!! I have my side yard blocked for now from Mishka going over there anymore, she took a cucumber and an onion minutes after I planted them, I figured she doesn't need to be over there anyways and tomatoes and onions I know are somewhat toxic to dogs (which is weird cuz in most dog foods, tomatoe is an ingredient) so since this side yard is small, I blocked it off. 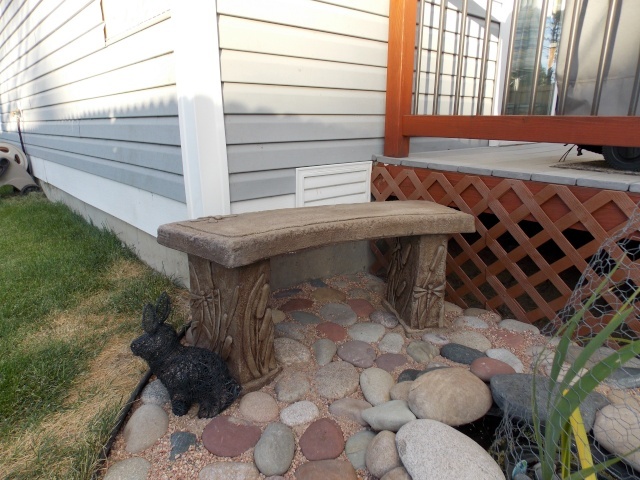 I love the way you did your corner planter too! Looks awesome! Everything does Jenn, you guys did an amazing job! Thanks Jimmy, i love your yard to! i have killed Columbine (maybe dogs) in my dreaded shade corner. they like the sunny front of the house much more, they just reseed themselves every yr. maybe i will try to get seeds this fall and try in the back again. i love how they keep changing colors every yr as well, never know what im gonna get. Sierra also gets AWAY with more then she should because of her cuteness!
" Sierra also gets AWAY with more then she should because of her cuteness! And the thing with Sierra...lol...that's how it is with Mishka and I...I just can't get mad at her! She just looks so happy when she's doing destructive things, lol...and too cute for her own good. I am really shocked though at Sierra, hahaha, she just looks like such an angel! oh and Jimmy, i can not do pots in the back yard, take one guess why but i will look into that ivy, i do have an ivy type of cover now its just not spreading as fast i thought it might. That looks awesome Jennifer, it really does. wow amazing garden, and i hope Sierra is ok after eating the Water Hyacinth from the pond. we have to finish fence the rest of the garden form Leo, . Jen. 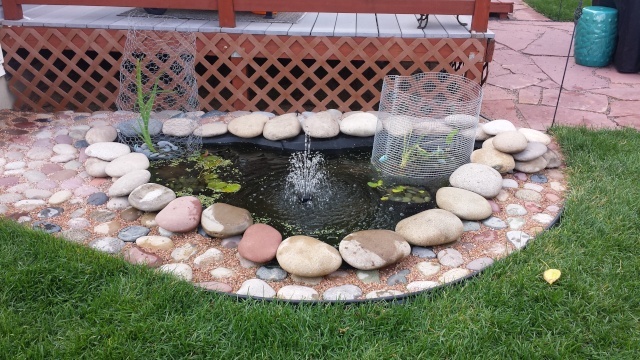 I love the big, round rocks at your pond edge! Maybe Sierra needs her OWN edible garden to leave yours alone. Yeah, right - yours probably tastes better Those soft buff, pinky-red colors of the stones really make everything so restful. 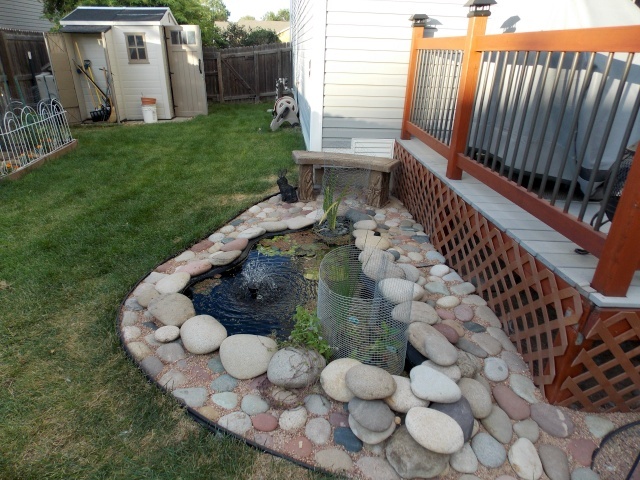 I love your pond, such a nice and relaxing look to it. Creeping phlox is a good ground cover. 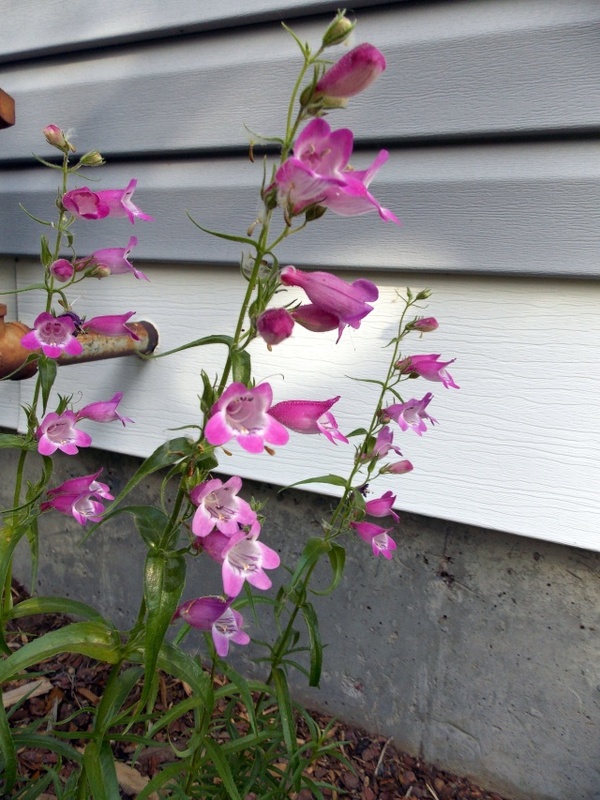 Grows a little slow but has been very hardy for me and has a long blooming cycle at the beginning of the spring. It's also prickly so sierra might leave it alone. Shade corner, have you thought of Hosta? THey are easy to grow...not sure if Sierra will eat the leaves. Sometimes the squirrels try to eat mine. I have part sun sun and shade hostas and even it the dogs walk on them when little they seem to avoid them by this time of year as they are bigger. Then again my columbine lived for 3 years in the shade next to the hosts but never came back this year? So maybe it is just chance that the hosta are doing fine?They both "moved in" at the same time. Colleen i had hostas over there but they did not live, maybe now i have water flowing they will do better, i will try next spring, spent way to much $ on the yard and pond this yr! so after replacing like 6-7 zucchini plants i finally got 2 to survive Sierra and were growing and had flowers, guess what happened yesterday? i now have one zucchini left, i will be double chicken wiring it and watching her like a hawk. your mini garden look like its doing well, but then i saw the aftermath. 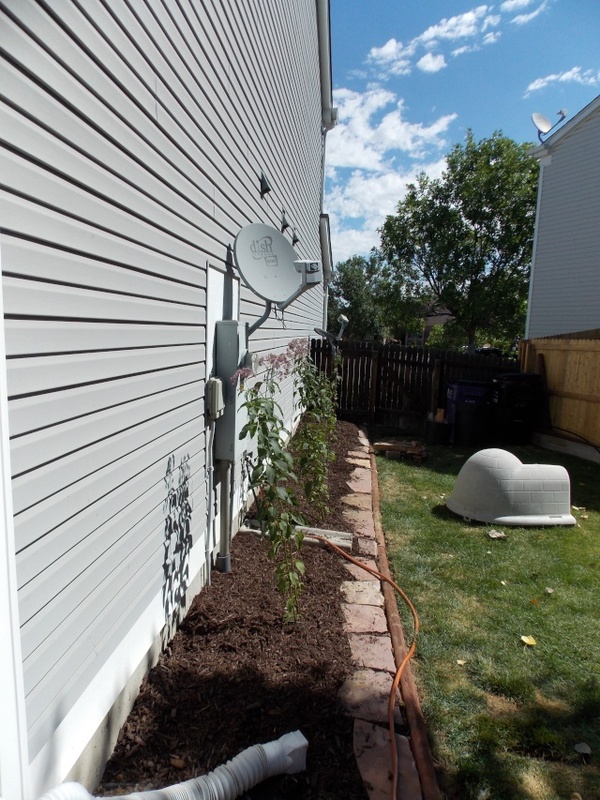 i hope your plants do better with the double chicken wire and hawk eyes watching. I think Sierra and my Mishka would get along GREAT!!! Love the front yard in bloom!!! Looks awesome! Are those pumpkins in the right hand corner of your vegetable garden? Bugs got my zucchini. They have been far more viscous on my garden this year than any critter could have ever dreamed of being. Glad to see you front yard has woken up after that little choke back earlier on. It looks great. Jenn, it's not bugs for me - well, I've killed a few tomato worms but not too bad - it's the blasted mice! I have a green pepper plant that set one really nice looking pepper, I was waiting for it to start to change colour - and of course the mice managed to eat about half of it! It looks like there's a half dozen more that are set so I may get some from it yet! I also have a yellow pepper plant (produces long yellow peppers) that they haven't bothered. I set some regular mouse traps out, they ate the peanut butter and tripped the trap but noi mice in them - argh!! Yellow crook neck squash is about ready to get harvested - looks like I have a couple dozen of them and they're looking good, so far! and the mice don't seem interested in them (knock on wood). Cucumbers are doing well, the only problem I have with them is getting them before they get too big. They hide nicely under the leaves and sometimes I don't see them till they're football sized (okay, not quite but way big). Took a half dozen of them into town to a friend yesterday. 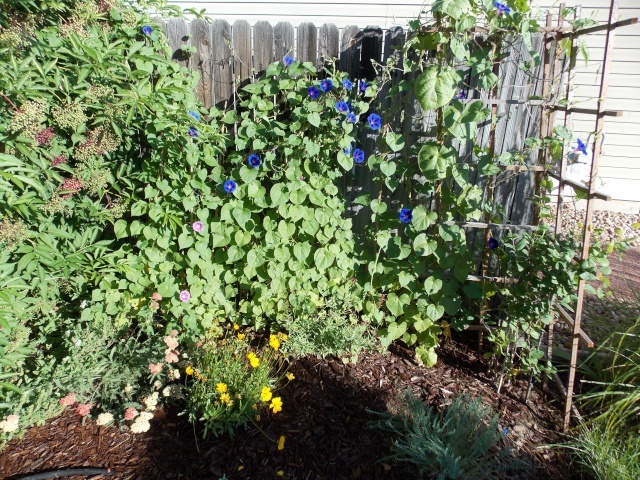 The blasted cucumber plant is taking over my garden space though ... four plants that have covered most of a 10 x 10 area, need to remember next year to give them more room all to themselves! 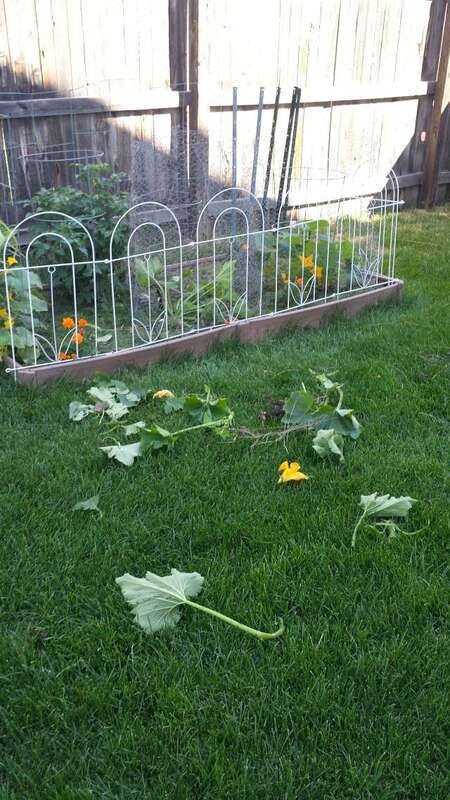 Jenn - maybe next year, plant a "Sierra Garden" just in front and on the sides of your garden, with lots of squash for her to attack. And be careful what you wish for - I have 9 zucchini sitting in the crisper, down from 14. My yellow squash is not doing as good - only 3 of them in the crisper. BUt nothing new coming - it has been cold and rainy and the slugs are unbelievable this year. I love your island bed out front and the "making whoopie" daylily is beautiful. 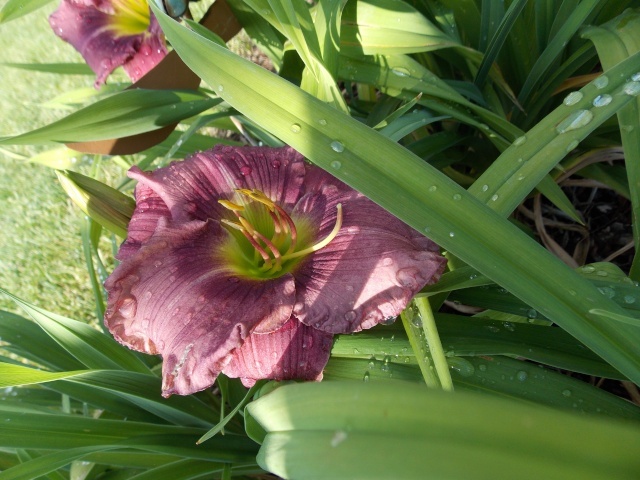 Lovely, rich color...but then, I'm partial to daylilies in general. 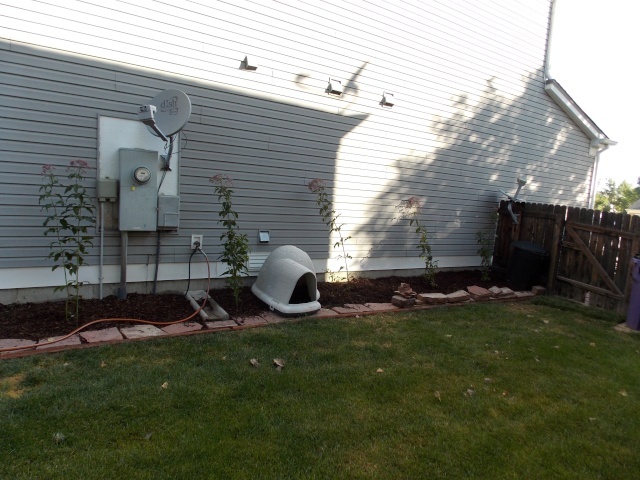 How do you feel about the invisible fence thing, I know its not for everyone - petsafe has this outdoor rock thing that is battery operated. You could stick the "rock" in your garden and use it wirelessly or add a wire to keep her out. no pumpkins (did not try) has other squash going but Sierra ate them to. my cucumbers are only a few inches long right now, and my basil is taking off as is my one cherry tomato. Now to play the waiting game and plan a fully inclosed fence for next spring that is Sierra proof. Jenn, i am still waiting on my burning bush, only a quarter of it is leafed, going to wait it out till next spring, do some trimming this fall and see if it fully comes back or not. Happy my tree did. LOL Amy, I can even picture it!!! I think every single one of my huskies have/had that one thing that scares the bejeezus out of them but it's so hilarious because of the ridiculousness of the situation. So by now i have lost both cucumber plants to Sierra, i still have basil going and my cherry tomatoes and the lone zucchini plant i fenced in. I did some major work in the yard this weekend! 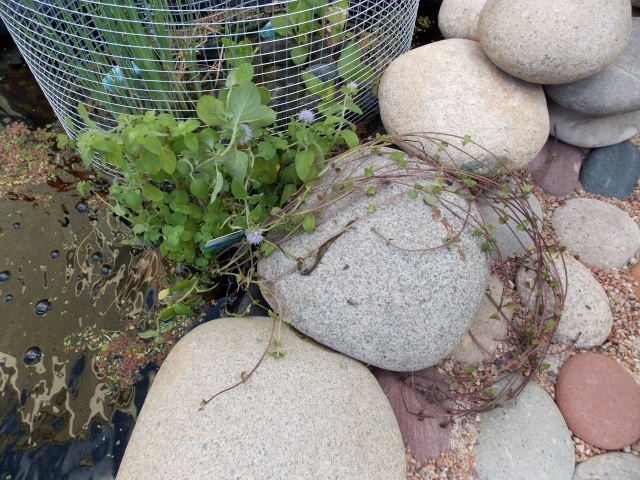 Ken was gone so i "played"
and a new pond plant, pond mint, it smells so good and i like the off shoots on it. now for the huge project i started sat night cause i went to pick up my bench and all the plants for 50% off, i just could not help my self. I have now completed the back yard!!! 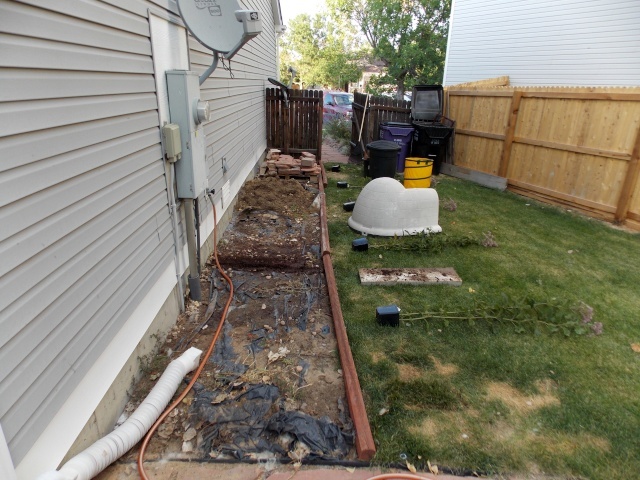 this was our junk strip, i had to remove rock, that i have been trashing for the last month or so, then i had to grate out the pile of dirt in the middle from waste when we did the grass, and then move all the left over flagstone. and other random crap. also dug the trench for the wood edging. I started this at like 7pm Sat. and finished digging the last plant at 9:30pm with a head lamp and lantern for light! So that is it for now, im so happy with everything.